The theory that the third Monday in January is the unhappiest day of the year has a ring of should-be-truth about it. Certainly last January I did nothing but grumble, despite kicking off the month with two Tove Jansson books whose brightness ought to have easily illuminated the month. The previous year I soaked up the sun in Kate Chopin’s The Awakening; the year before that, Richard Yates’ Collected Stories was more intensely gloomy than anything that could possibly have been going on in real life. That was probably the more effective tack in staving off the January blues. 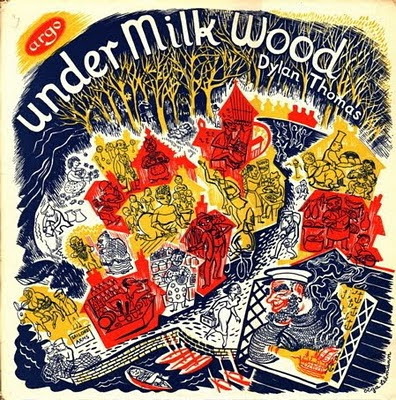 This year, Oliver Postgate’s autobiography led in a surprisingly similar direction: his mention of Dylan Thomas’ radio play Under Milk Wood as an influence on Ivor the Engine had me thrilled to be petrified at Richard Burton’s blacker than black delivery of that omniscient narration picking out the parochial foibles of a dysfunctional Welsh village. Mrs Dai Bread I and Mrs Dai Bread II winding each other up over conjugal rights assisted by a crystal ball, and Ocky Milkman revealing several years after the fact (to me, at least) the source of Momus’ last-but-one album title. This week on Click Opera he features a slightly later (60s rather than 50s) collision of the BBC and poetry, which is good and gloomy and touching too. Soon Click Opera will be gone, and what can you say about that? It may have been exhausting and repetitive sometimes (not actually that often), but it was as big and bright (both senses) as blogging was ever going to get – thanks so much, Nick. At least he is tiding us over into February. Other casualties of Blue Monday Month have been Jon Dale’s Attic Plan blog and – maybe, hopefully not – Tim Footman’s Cultural Snow, which rarely fails to make pop culture sound as interesting as it thinks it is (does anyone else in the world manage this?) Attic Plan didn’t get many updates last year, but the one that made me catch up with Birdie’s Some Dusty album sure was appreciated. Against this falling-off trend, Estelle Tang’s fabulous 3000 Books blog moved, and got a makeover, but then January isn’t so cold in Australia*. I notice she is reading The Stories of Breece D J’Pancake, which has been on my reading pile for a while too. Supposedly it is very depressing indeed – think I might let it roll over to the beginning of 2011. * Hang on, that’s where Jon Dale is as well. The first time I went to S.’s flat, she was so aghast that I had never seen The Clangers that she stopped her birthday party to show me an episode. They are pretty fundamental to her world view, though it would be hard to say why. Maybe that the programme is modest and wildly imaginative all at once. Bizarre and homely, affectionate and strange, impossible but completely logical. Why wouldn’t the centre of a planet be kept warm by soup? That being so, surely the soup must have a dragon to serve it up? I remember watching the first series and being enchanted with the progression of ideas: a cloud that rained notes, which grew into music trees, which shed more notes, which powered a flying machine. The swanee whistle voices of the pink, mouse-like Clangers themselves sounded curious and receptive, but not naïve: the male Clangers’ armour was there to protect them from the unexpected visitors that a small planet would naturally draw, even if it did sit strangely with their knitted bodies. The Oliver Postgate / Peter Firmin series I remember watching as a child are Ivor the Engine and Bagpuss (‘Why does everyone always go on about Bagpuss?’, wonders S.) – the former just right for a small boy, the latter a bit girly, once a chap has found out about cars, guns and space. See also George Bernard Shaw, Christopher Isherwood and Antoine de Saint-Exupéry making the same point. But Oliver doesn’t spend all his time railing. He spends quite a lot of it making things. Between 1957 and 1963 he supplies ‘unlikely articles’ at short notice for ITV. The examples he gives are a collapsible soufflé (‘He said: “Sorry to trouble you, but they tell me you can supply us with a collapsible soufflé.” “Do they?” I asked, playing for time.’ (p. 197)), a cubic metre of fresh seaweed, and ‘a full size effigy of General de Gaulle to be burned on the bonfire in David Frost’s firework-night programme.’ (p. 199). His stop-motion camera is a normal 16mm film camera adapted with Meccano. Most impressive perhaps is his greenhouse roof idea, developed during the ’70s. It consists of a layer of black, corrugated metal, a gap of a few inches, and a layer of glass, used to cover the roof of a house. Some funding was forthcoming and he found that with this setup he was able to keep a large model house in his garden warm and supplied with hot water from ‘early spring to late autumn’. Unfortunately, the house-building company who had paid for this prototype decided that ‘the artefact did not have a large enough “maintenance component”’ (p. 312), so would generate no income once installed. He invents several devices for the companion of his later years, Naomi, to help her cope with ME – including an electric wheelchair with power steering. When his parents move from London to where he is in Kent, his first thought is: ‘This was an enormously exciting idea. I had always wanted to design a house’ (p. 259).